Reports from New Zealand have not revealed any personal injury of any members of the country’s Jewish community following yesterday’s earthquakes. The president of the New Zealand Jewish Council Stephen Goodman told J-Wire: “At this point we are unaware of any specific problems with the community or individuals as a result of the earthquakes. Two people were killed as a result of the 7.5 magnitude earthquake which hit the country’s south island. Chabad’s Rabbi Mendel Goldstein told J-Wire that he had received from anxious families who have friends and family members who are currently touring in the stricken area but has had no indications of reported to injuries. A magnitude 7.5 severe earthquake has struck 15 km north-east of Culverden at 12:02am, Monday 14th November. The magnitude 7.5 earthquake was 15 kilometres deep. The highest level of impact reported so far has been MMI8 (severe) this level of shaking includes people experiencing difficulty standing. Furniture and appliances shifting. Substantial damage to fragile or unsecured objects and a few weak buildings may be damaged. 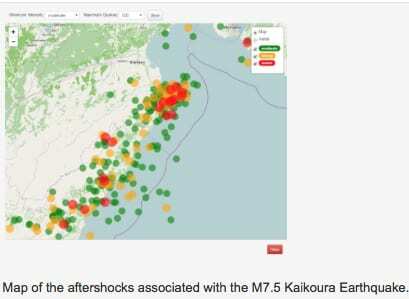 This level of shaking was reported via the GeoNet felt reports in the upper South Island and lower North Island. The inital earthquake was felt widely throughout New Zealand. Currently, there are more than 15,000 Felt reports.There have already been many aftershocks recorded, the largest has a magnitude of 6.2.